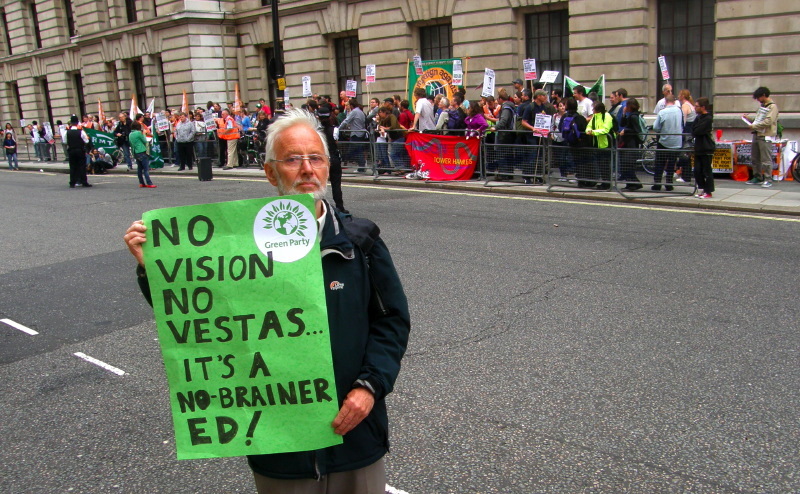 March in support of the Vestas workers, Isle of Wight, July 24, 2009. Videos from Seize the Day (top) and Ventnor Blog. http://savevestas.wordpress.com -- July 27, 2009 -- Many are talking about the ineptness of New Labour, epitomised by its spokesperson on climate, Ed Miliband. Not only has the Labour government shown to be dissonant, with its mixed messages on climate change, but also exposed by its rhetoric. This is definitely a consequence of the actions of the Vestas workers. Listening to these bright young speakers [from among the Vestas workers] who have indeed shown their personalities and their eloquence in recent speeches and interviews, they have also shown their ability to become political and argue deftly with these so-called experts. The solutions espoused by these contemporaries are embarrassing to the political “experts” and put them in the shadows. It is not only New Labour who fail but also the rest of the cartel parties who sing off the same songsheet. Not one of the mainstream parties speaks for the workers or the island or indeed the country but are all shown only to be sympathetic to big business. It is not unreasonable to appreciate the potential. It is not without credence to consider these young workers as future independent worker-politicians. There are many examples where campaigners for hospitals or schools have stood in their constituencies for what they believe in. It is for this reason that Vestas workers should consider standing in the coming general election, selected by their peers and voted for by Isle of Wight citizens. People are looking for an alternative to the parties of the status quo. These young people are developing many ideas and putting forward many solutions in favour of ordinary people as far ranged as the environmental integrity of the planet. These workers have engaged in the act of finding out about things by engaging in a very practical struggle, which is bearing a complexity of fruit. What they are discovering in all of this is that the most important factor is the human factor. Vestas is just a name, a name of a company that acquired a space with some means of production inside of it; the real value in the production of wind turbines has been the skills of the workforce and their social productivity. It is the consciousness of the human factor and the consciousness of what could be achieved that has a growing confidence about itself. It is the confidence that expresses itself in the belief that it is not only that production of wind turbines can continue, but it probably will continue in a different way than what it was before and in such a way that the workers previously known as Vestas workers will have more freedom in the decision-making process to become free workers who are the motive force to recommence production. Vestas has been shown up for being authoritarian and dismissive of its workforce. The government and the powers that be have also tried to be as dismissive of the actions that have taken place. This state of affairs has been challenged by the workers and has inspired and led others in similar positions. The workers have taken a step towards liberating themselves and upholding their dignity and the dignity of labour – this must go further. Mike Bradley, one of the Vestas occupiers, addressed the rally outside the factory on July 24 after the march. Praising those still inside, he said that “They’ve shown everybody on this Island that it’s possible to defend jobs”. “The Labour government should be utterly ashamed” he said. “This is a fight that can be won,” finishing with “If you roll over, you lose. If you fight, you win.” Audio from Ventnor Blog. July 22, 2009 -- The madness of the capitalist market has yet again been starkly exposed as -- in the midst of the planet's worst environmental crisis, global warming -- workers at Britain's only factory building wind turbines have been forced to occupy their plant to prevent its closure and save their jobs. The July 21 Morning Star reports that the workers are demanding that Britain's Labour government nationalise the plant. The workers' report that they have been beseiged by riot police, who are attempting to starve the occupiers out by preventing locals aand climate campaigners from delivering food and supplies. Vestas Blades UK on the Isle of Wight is due to close on July 31. Six hundred jobs will be lost immediately, many more jobs that depend on Vestas will follow. This makes no sense from a green or a labour perspective! The government has just announced a major expansion of renewable energy including wind power. We are calling on Vestas to keep the factories open, saving jobs and offering those who want to leave a better redundancy deal. We are calling on the government to intervene to save jobs at Vestas -- through nationalisation if that is what it takes -- to show that it is serious about saving the planet. Morning Star reports: Production workers launched their occupation of the Vestas factory on the Isle of Wight in protest against the bosses' attempts to close down one of the island's largest workplaces and throw staff on the dole at the end of the month. Executives at the multinational Danish firm claim that they have "lost faith" in the government's promise of huge investments in renewable energy and will now move the production of wind turbine blades to factories in the US and China. But their staff are determined to resist, pledging to continue the occupation "for as long as it takes" -- even as their bosses imposed a lock out on the remaining production workers at the site. "We are fighting for our jobs and a greener environment", a statement from the Vestas workers declared. "As workers at a wind turbine manufacturer, we were confident that, as the recession took hold, green or renewable energy would be the area where many jobs could be created, not lost. "We want the government to nationalise the company and stick to its word because it has stated that it wants to create as many green jobs as possible, but so far the government seems quite happy to let this factory close." Speaking to the Morning Star from inside the occupied factory, Mark -- who did not want to give his full name for fear of reprisals -- stressed that the staff had "done everything that management asked, keeping up the quality of the work so that Vestas would continue to invest in the plant." Mark related that he had been making wind turbine blades for seven years. "I have a family, a 14-month-old daughter and I've lived on the island all my life, but, despite making more than £350 million profits last year, our bosses want to add us to the already dire unemployment figures on the island." He revealed that Vestas was "strongly anti-union -- management ask people at their interviews whether they are a union member or not -- and have refused to talk to us about what they intend to do, which is one of the reasons we have occupied the place." On July 20, police were surrounded the factory while Vestas bosses called in private security guards and cut phone and internet communication to the site in an attempt to intimidate the workers. But support from the local community has poured in, with residents passing food and blankets to those inside. Ryde and East Wight Trades Council secretary Tony Kelly urged trade unionists to support the occupation, pointing out that "the loss of these jobs would be a hard blow anywhere in Britain but, because the Isle of Wight has had no investment in the last decade, there are no other jobs." Visteon car workers, who won their fight for redundancy pay after staging similar factory occupations, have also sent messages of solidarity, while the Campaign Against Climate Change echoed the Vesta workers' demand for nationalisation, insisting that the government "should take over the plant and restart production". Send messages of support from yourself or your organisation to savevestas@googlemail.com. Petition energy minister Ed Miliband. His e-address is ps.ed.miliband@decc.gsi.gov.uk. His phone number in his Doncaster constituency is 01302 875 462, and at Westminster, 020 7219 4778. Flood him with calls for the government to take over the Vestas factory and keep it producing, under new management. Visit the workers' wbsite at http://savevestas.wordpress.com/ and pass onword of their struggle. Unions and climate change campaigners have joined forces in solidarity with Vestas workers in their second day of occupation at the factory on the Isle of Wight. Vestas employers are keen to move production abroad to China and the US with the loss of 625 jobs, despite making over £34 million profit in the first quarter of this year alone - up 70 per cent on last year. But the defiant workers at the wind turbine production plant showed no signs of backing down until their demands for nationalisation and restoration of their "green jobs" at the plant are implemented. A 200-strong picket line has massed outside the factory in support of the occupation. In response to the show of strength by the workers, Vestas management have closed the factory and hired a private security firm to "protect the premises." The anti-union employer stepped up the blockade by cutting communication lines and access to food and water. Even though no crime has been committed on the site, Hampshire Police have set up an "operations base" in the building where the occupying workers are holed up. The workforce have accused the police of being complicit in stopping food and water from reaching them. Police arrested a man on suspicion of breach of the peace as he tried to enter the building in the early hours to deliver food to the workers but released him without charge. But a mass walk-in from supporting protesters outside the plant made it inside this afternoon to get food to the workers. Floods of support have poured in from all over Britain, with trade unions and climate change activists eager to show solidarity. RMT general secretary Bob Crow declared the union's "full support" for the occupation and urged the entire trade union movement to get behind the Vestas workers. "Nothing underlines the attack on job and communities that has been unleashed in the UK by greedy bosses and incompetent politicians better than the occupation at Vestas," he said. Mr Crow underlined the importance of the occupation and agreed with the workers' calls for nationalisation. But the RMT leader, who plans to address workers at the factory gates today, questioned why the police had such a heavy presence at the site. "Why is the state intervening in what is a perfectly legitimate trading dispute? "This is a major issue for whole trade union movement - we can't allow these workers to be starved back to work," he said. "There's a simple solution to this dispute. The government should nationalise the factory, protect the jobs and show that they are walking the walk when it come to green and renewable energy." Unite national secretary for manufacturing John Rowse urged the government to save Vestas. "It would send out a clear message that it is serious about saving the environment as well as supporting UK manufacturing," he said. Climate change campaigners staged a rally against the closure outside the Department of Energy in central London in support of the occupation. The occupation by 25 workers of the Vestas wind turbine plant on the Isle of Wight continued to gather support from unions and MPs amid further arrests and growing protests. Hampshire police said two men were arrested close to the Vestas Wind Systems site on Tuesday night following three arrests earlier that day. The latest arrests were of a 41-year-old man on suspicion of criminal damage and a 23-year-old man on suspicion of a public order offence. The sit-in is part of a bid to save the factory from closure next week with the loss of over 600 jobs. The Danish owners of the factory have erected a fence around the site in response to a growing protest by environmental and climate change demonstrators. Workers said the fence had been built to stop food or drink being sent in, leading to complaints that the company's action was illegal. "It's appalling," said one of the workers. "We are convinced this is against the Human Rights Act because we are being denied humanitarian aid. "But the more the management try to flush us out, the more determined we are to dig in our heels." The occupiers were backed by Labour MP John McDonnell, convener of the Trade Union Co-ordinating Group. "These workers are at the forefront of the struggle to save their jobs and our planet," he said. "The TUCG stands shoulder-to-shoulder with this occupation and calls for full support and solidarity with this vitally important campaign." The TUCG comprises eight unions - the RMT, PCS, BFAWU, FBU, NAPO, NUJ, POA and URTU. Bob Crow, RMT General Secretary, who was scheduled to visit the site last night, said: "We know from this company is aggressively anti-union and the TUCG salutes the courage of those who have taken the brave decision to occupy the factory. They deserve the full support of the whole trade union movement." PCS assistant general secretary Chris Baugh called on the government to intervene "to save the plant in the interests of the Vestas workers, the regional economy on the Isle of Wight and the future of the renewables industry in the UK." Morning Star -- The Rail Maritime and Transport Union (RMT) has pledged legal assistance to workers occupying a wind-turbine factory on the Isle of Wight. Around 25 workers have been occupying the Vestas Wind Systems plant on the island in a bid to stop the factory closing next week with the loss of hundreds of jobs. Dozens of climate change and environmental activists have also set up a camp outside the site in support of the workers. The workers have been told that the Danish owners will go to court next week to seek a possession order to stop the occupation. In addition to promising legal help for the workers, RMT also called for talks with Climate Change Secretary Ed Miliband to try to save the factory. General secretary Bob Crow, who visited the site this week, said the union was also making arrangements to get food, water and other supplies into the factory. This might include the use of a helicopter, to prevent the workers from being "starved into submission." "The whole of the trade union and environmental movement should be proud of the courage and determination being shown by the workers at Vestas in the teeth of threats and intimidation," he said. "We all have a duty to ensure they are not beaten into submission." One of the workers within the plant commented: "People are coming along to show their support and that means a lot to us, the more support we get the better. "Hopefully people will come along and see us because it's all very important, this is for the island and we have to save these jobs, there's lots of families affected." Tracy Ferne from the Camp for Climate Action said that people were angry at the treatment of the workers at the hands of the police, Vestas management "and the government's empty renewables rhetoric." She was scathing about Mr Miliband's claim that there would be a huge investment in the renewables industry and 600,000 new green jobs. "It's all talk," Ms Ferne said. "The government is not pledging any money to save 600 genuine green jobs now." Socialist Worker (Britain) -- July 25, 2009 -- More than 400 people rallied outside the occupied Vestas wind turbine plant on the Isle of Wight tonight after a march from Newport town centre. The workers have now been in occupation for four days in the fight to save their jobs. Workers and supporters believe that the occupation can win. Another demonstration is planned for 6pm on Saturday, outside the factory. Campaigners are urging people to come to the Isle of Wight to join the constant camp and the picket outside the plant. July 26, 2009 -- http://savevestas.wordpress.com/ -- Yesterday [Saturday, July 25] was fairly quiet for the early part of the day. Spirits were still high inside after the previous evening’s march and rally and the deliveries by tennis ball of tobacco, papers and most importantly the equipment needed to get them internet access inside. The police and security are a bit more relaxed now and the tennis balls that fell short were thrown up to the workers by some of the security guards. No one is being arrested as yet for trespassing on the waste ground next to the factory where the balls are slung in from. Food continues to be a problem. Breakfast arrived and was a choice of a half sandwich – either peanut butter, cheese or paste – a bit of fruit and some milk. The milk was most welcome as some teabags had made it in during the mass trespass and it meant their first cup of tea all week. The rations remain pitifully short however and they are fed only twice a day. Just barely enough to keep them alive for now. A volunteers' committee was formed and met early in the afternoon consisting of people from the various groups present to support the workers committee and the issue of food was discussed and some ideas fed back to the workers committee. There is a big push on now to get organized for Wednesday’s court hearing and to have good attendance outside the court. The families are now beginning to co-ordinate and support each other and messages from inside on much needed support on personal issues, like rent and bills that need to be paid, have come out and are being attended to. The campaign funds for this occupation are much needed due to the nature of this occupation as although they have been paid they can’t get out to access the money they have for day to day support of their families and homes. Mobile phone bills are huge as they have had to rely on them for communication. During the afternoon they built a kite and tried to fly that out to get a line in for supplies to be winched up to them but the wind was against them. Several of the crowd went off to B&Q and got a load of waste pipe and connectors to build a line in. The workers committee asked them not to put it in as it was not likely to work and might have threatened the tennis ball deliveries which are working. Towards the end of the 6pm rally a protestor got over the fence and tried to make a dash with a bag of food but didn’t make it more than a few yards before being wrestled to the ground by security. The crowd responded instantly by rushing to the barriers, banging on them and shouting for the food to be let in. It showed the amount of tension surrounding the food issue and the workers committee did a good job of getting the situation back under control. About a half hour later a hot meal was finally delivered inside – spaghetti bolognese and pitta bread. They have been going through all of the messages of support and that, along with the continued presence outside, is keeping them going and keeping their determination to win strong. Morning Star, July 27, 2009 -- The occupation by workers at the Vestas wind turbine plant on the Isle of Wight has entered its second week with bosses seeking a court order allowing them to evict the protestors. A hearing has been scheduled for Thursday. The company is seeking a possession order for the site which would allow them to remove the occupiers by the end of the week when the factory is scheduled to close. The 25 protesters have vowed to remain on site until their demands for the reinstatement of their and 600 other workers' jobs are met. They have received support from unions and environmental activists who have joined the protest. The RMT union said that it will give legal assistance to the workers and also called for talks with Mr Miliband to try to save the factory. General secretary Bob Crow called for a show of strength from trade unionists and environmental campaigners in what he described as "a crucial week". He said: "I would urge all trade unionists and environmental activists to make every effort to step up the campaign for the Vestas workforce in what will be a crucial week for their attempt to stop the closure of the factory." Referring to the Vestas management's attempts to evict the workers, he stated: "It's scandalous that the company is threatening to physically drag the workers out of the factory this week and we need to send a message loud and clear that they have massive support for their actions both here in the UK and around the world. "The Vestas workers are not criminals. The criminals are the companies who think that they have the right to destroy jobs with no regard to the long-term damage that they will inflict on our communities." One of the workers occupying the factory said: "We are trying different ways of saving the factory and have suggested to Vestas that they make smaller turbines here which would be more suitable to the UK. We have also sent a series of questions to Ed Miliband and await his reply with interest." The Department of Energy and Climate Change said that the factory did not make turbines for the UK market, adding that cash was not the issue. Occupation 67 days, chimney top protest 76 days! Ssangyong Motor workers are in a hard struggle and rightly so against Lee Myung-bak government’s flexible labor policy. At the center of flexible labor policy are practices such as dismissal, early retirement, outsourcing and reshuffling. All meant to destroy a worker’s right to live. The reason we are fighting is simple. To us, dismissal feels like murder and we are struggling to stop this murderous act. Our confidence and commitment are soaring high like a rocket because everyone knows we are doing the right thing. We will never be defeated. Ssangyong Motor workers will continue to firmly struggle until there is no such thing as redundancy dismissal. We would like to comradely thank for your solidarity and wish you all victory. July 29, 2009 -- Ventnor Blog -- We were back outside the Vestas plant again tonight when Vestas worker, Steve Stotesbury, made the sombre announcement (video to follow) that the workers protesting inside the plant had been informed by Vestas management that they had been sacked. Steve was pretty choked when making his address, but as you’ll hear from the interview, he remains defiant to help save the jobs of 600 employees of Vestas Blades. He told us about plans discussed tonight to support those who have lost their redundancy money and what people can do to show their support. As those following the Sit-In will know, Wednesday morning sees the injunction requested by Vestas be heard at the Court in Quay Street, Newport. Steve told us that meeting (to which the public are urged to attend) had been planned for 9am outside Vestas on Wednesday morning and that following that there will be a march down to the Court for the 10.15am hearing. The workers and supporters hoped for good numbers tomorrow morning as well as at the 6pm rally outside Vestas on Wednesday evening where there will be several guest speakers. Morning Star -- Vestas workers who were "sacked by pizza delivery" have defeated bosses' attempts to evict them from their factory occupation. Executives at the Danish multinational firm failed in their court bid to end the protest against mass redundancies at the wind turbine manufacturing plant on the Isle of Wight - but stepped up their efforts to starve the workers into submission. Bosses had sent some workers dismissal letters hidden in pizza boxes, but a judge ruled that the company had not properly served notice on the occupiers and deferred further court hearings until August 4. Speaking from the occupied factory, employee Michael Godley revealed that the company had promised to provide food and drink, but had only given the occupiers "a slice of pizza and some water. "Then the dismissal letters arrived hidden under the pizza," he explained. But Mr Godley insisted that management's deceit "has not deterred us in any way - we're still as determined as ever and we're going to carry on fighting. "We don't plan to leave any time soon," he declared. Some 25 workers are holding out at the factory, which Vestas wants to shut down and move to the US, throwing 635 people out of a job. The company, which raked in half a billion pounds profit last year, insists that demand in Britain for alternative energy sources is "too low to justify production." But offshore energy union RMT refuted the claim, pointing out that 2,700 wind turbines, more than double the current number in Britain, have already been approved and are awaiting construction. "The arguments used for closing Vestas are totally bogus," stressed RMT leader Bob Crow, whose union has backed the occupation from the beginning. Mr Crow explained that "Vestas has had millions in government subsidies and this week scooped up another £7 million in research and development money just days before they are due to close their only UK factory. "They have touted themselves around like corporate prostitutes, sucking up taxpayers' money while moving to dump their workers on the scrap heap," he declared. The factory near Newport, in the heart of the island, has now been occupied for nine days, while the remaining workers have been locked out. Workers at a second Vestas site in East Cowes have also been told to stay away from work, apparently to prevent that factory being taken over by angry staff as well. August 2, 2009 -- Morning Star -- Offshore energy union RMT has attacked the "totally bogus" reasons for closing the Vestas wind turbine plant after it emerged that a new £1 billion wind farm is to be built in Britain in the next two months. Energy privateer Centrica unveiled plans today to build the wind farm in Skegness -- but revealed that it would be acquiring 70 turbines from German manufacturer Siemens. Vestas, which is Britain's only wind turbine manufacturer, claims that it cannot sustain the plant and its 600 workers due to falling demand for wind turbines in Britain. But a Centrica spokesman admitted: "It is unfortunate there are no manufacturers here. The potential is huge." The timing of Centrica's announcement will heap further embarrassment on the government, which has promised to create thousands of new "green" jobs. RMT general secretary Bob Crow said: "Today's reports of the Centrica plans for a massive wind farm off Skegness blow apart the totally fabricated case for the closure of Vestas on the Isle of Wight that there is no demand for turbines in the UK. "That argument stands exposed as totally bogus. There is now no excuse for the government sitting on the sidelines while the Vestas workforce fight on for the future of turbine manufacturing in England." Mr Crow said that Vestas workers were fighting for "the future of green energy" in Britain and called on the government and the union to work together to draw up an "immediate rescue plan. "The Scottish Parliament did it in Kintyre earlier this year when Vestas pulled a similar stunt and Ed Miliband must take immediate action to save the turbine manufacturing capacity on the Isle of Wight," he added. Workers continuing their occupation of the Vestas factory were boosted on Saturday by a 200-strong rally outside the factory bringing food and supplies to the embattled workers. One worker has already been taken to hospital suffering from malnourishment. However, the company reimposed a food blockade yesterday, stating that Saturday's temporary lifting was just a "goodwill gesture." Michael Bradley, a spokesman for the occupying workers, urged the rally to protest against management attempts to evict staff from the factory. "We are paying the price for someone else's crisis. It is difficult to sum up how horrendous Vestas has been," said Mr Bradley. As the political and legal struggle around the dispute intensified, RMT gained official legal opinion from leading human rights lawyer Louise Christian stating that there is a "positive obligation" on the state and its "agents" to prevent "private individuals from depriving others of their liberty." Ms Christian added: "Police have a positive obligation to prevent the security agents employed by Vesta stopping people coming in to deliver food to those in occupation."